Stir together the yuzu juice and soy sauce to combine. Add the chia seeds and let them soak for about 10 minutes. 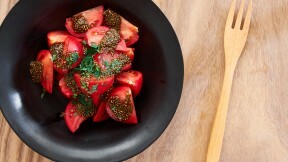 Slice the tomatoes into wedges and dress with the chia ponzu. Garnish with flat-leaf parsley.